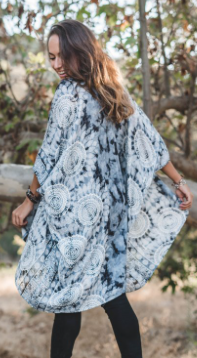 Embrace the breeze in this flowy, lightweight boho kimono. Offering ample coverage in the front and back, this will be your new favorite cover up! Pair it with a casual outfit or wear it over a bathing suit to the beach as a swimsuit cover up. This lightweight kimono cardigan is an easy and convenient accessory to wear. Kimono falls mid thigh in back, to mid knee in front on the sides.